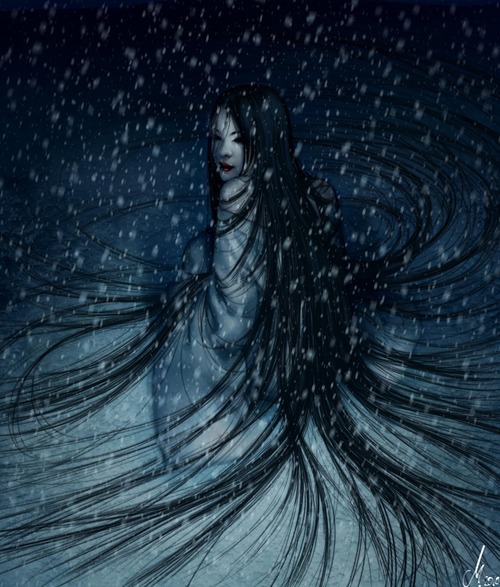 We came upon her in the snow, crouched in a field empty of all things but the white glare of the moon on the ice. Her hair was darkness cut out of the night, darkness out of the heart of a cave, and her skin and her robe were as white as the reflected night. She called to us, but we did not dare go closer. In the frigid air her words showed no breath, and her red lips were the color of spilled blood, not paint. When the sun came up, she became like icy mist, turned to smoke and faded from our sight. We left her behind, and turned our faces to the southern wind.